Another Money Back Challenge Winner: Congratulations Lorraine Robinson! It’s been a record of a week here at The Travel Franchise, and we’re excited to announce yet another Money Back Challenge winner. Lorraine Robinson will be receiving 100% of her franchise fee back, meaning she’s succeed in setting up her very own business for FREE. We caught up with Lorraine to hear her story so far, and to see what advice she has for other Travel Consultants working towards the Money Back Challenge. Lorraine joined the business as an Elite Travel Consultant in August 2017, so has been with us just over a year now. After completing her training, she went straight on to attend the Millionaire’s Retreat in September, which she says really motivated and inspired her to go for the Money Back Challenge win. What drew Lorraine to The Travel Franchise was her desire to spend more time with her daughter. “I knew I wanted to start my own business, I just wasn’t sure what or where to start”. She says she knew she didn’t want to sell a product, and so travel seemed like the perfect industry to go into. After looking through the Discovery Website, Lorraine said she thought it was almost “too good to be true”, and knew she had to enquire further. She wanted to be apart of a such a rapidly growing business and felt starting her own travel franchise could be the perfect solution to achieving the life she wanted. Lorraine achieved her Money Back Challenge target with just five days to go! She was so close, and she knew one more sale would hit it. She managed to secure a booking on the anniversary date of her joining the business, and funnily enough, the client travelled on the deadline day of the Money Back Challenge. She said she felt so lucky and that it felt like all her hard work had really paid off. We’ll be seeing Lorraine at the Sandals Ultimate Educational in St Lucia & Antigua this year and we also hope to see her at the Elite Experience at some point in the future to continue building her skills and confidence. We asked Lorraine how she has found her first year as a Travel Consultant, and what advice she would offer anyone else currently working towards the Money Back Challenge. She encourages everyone to network and form contacts but says not all events are for everyone. “I didn’t really get on well at wedding fayres but found my local BNI group to be very beneficial”. 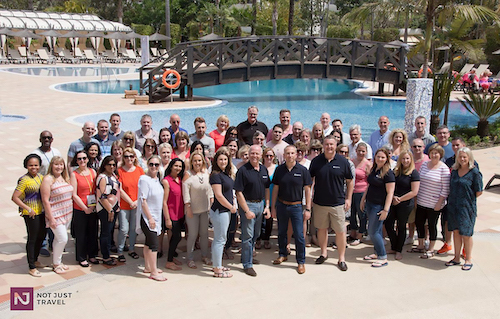 Many of our Travel Consultants have found the Business Network International to be a great place to generate new leads, but it’s all about finding the event that’s right for you. Through attending the training events, Lorraine met others in the field who inspired and motivated her, and she “buddied up” with another Travel Consultant so that they could support and encourage each other, which she said has been very effective. Lorraine has also been proactive with additional training; completing LinkedIn and social media training, as she personally found the admin side of the role the hardest part to begin with, but this is something she overcame very easily! Talking to people is at the heart of what we do, so Lorraine has done an excellent job at building those customer relationships and reaching her Money Back Challenge target. Well done Lorraine! Could you be the next Money Back Challenge winner? This just goes to show that whether it takes four months or a whole year, everyone can achieve the Money Back Challenge! If you’d like more information on the Money Back Challenge incentive and starting your own business, then get in touch with us here at The Travel Franchise today on 0800 084 8128.